The origin of the Boeing B-52 Stratofortress can be traced to design studies of a replacement aircraft for the very large propeller-driven Convair B-36. Too complex to be traced here are the many interwoven facets of these studies. An interesting history of the Boeing B-52 may be found in a book by Walter J. Boyne entitled Boeing B-52 A Documentary History (published by Jane's Publishing Co., 1981). First flight of the prototype B-52 took place on April 15, 1952, and now after more than 30 years, the type still serves as a major element of this nation's nuclear deterrent force. No more impressive tribute to the basic soundness of an aircraft design could be found. After a total production run of 744 units, the last B-52 was delivered in October 1962. The aircraft first became operational in the Strategic Air Command in June 1955. The B-52 was produced in models A through H. A three-view drawing of the B-52G is shown in figure 12.8; photographs of a B-52H are presented in figures 12.9 and 12.10. The landing-gear arrangement is illustrated in figures 12.11 and 12.12; refueling of a B-52 by a Boeing KC-135 is illustrated in figure 12.13. As with so many successful aircraft, the term B-52 encompasses a whole family of generically related types of similar appearance but with major and minor differences in systems, equipment, and performance. Physical and performance data are given in table VI for the last version of the aircraft, the B-52H. 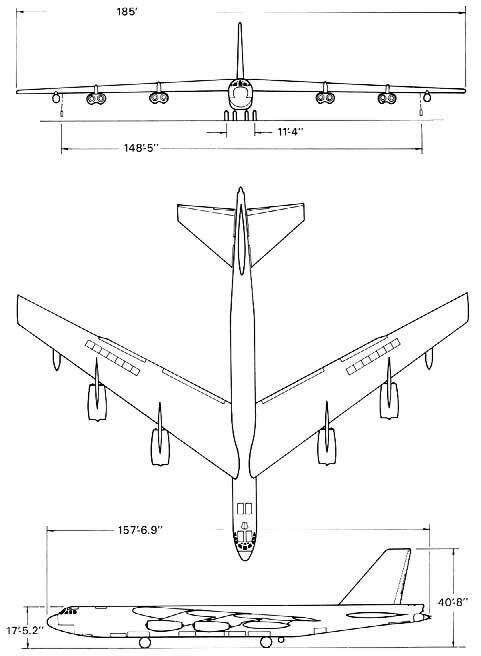 As seen in figure 12.8, the basic configuration of the B-52 is similar in concept to that of the B-47. The shoulder location of the sweptback wing, wing-mounted engines, and bicycle landing gear are all reminiscent of the earlier aircraft. As shown in table VI, however, the B-52 is a much larger and heavier aircraft than its predecessor. The wing of the B-52 has a sweepback angle at the quarter chord of 35°, an aspect ratio of 8.56, and airfoil thickness ratios that vary from 14 percent at the root to 8 percent at the tip (these thickness ratios are only approximate). 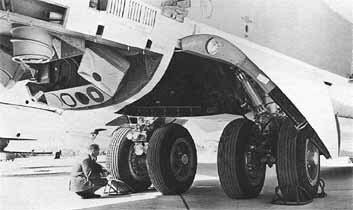 Fowler-type single-slotted flaps for lift augmentation are located at the trailing edge of the wing. These large flaps may be seen in figure 12.11. Hydraulically actuated spoilers are used for lateral control and, in the symmetrically deployed configuration, assist in flight-path control during landing approach and braking during rollout. On the A through F models of the aircraft, lateral control was provided by the spoilers working in conjunction with conventional ailerons. Wing area of the B-52 is 4000 square feet, nearly three times larger than that of the B-47. ....by the bicycle landing gear. The far forward position of the aircraft center of gravity relative to the rear bogie requires an aerodynamic moment for rotation much larger than could be provided by the small, manually actuated elevators. The landing gear of the B-52 is of the same bicycle arrangement as employed on the B-47 but has four two-wheel bogies instead of the two bogies used on the earlier aircraft. Details of the landing gear are shown in figures 12.11 and 12.12. As compared with their location on the B-47, the outrigger wheels are positioned much nearer the wingtip on the B-52. (Compare photographs in figs. 12.11 and 12.6.) An interesting feature of the B-52 landing gear greatly eases the problems posed by crosswind landings. Both the front and rear bogies can be set at angles of as much as 20° to either side of the straight-ahead position. In a crosswind landing, consequently, the aircraft can be headed directly into the wind while rolling down a runway not aligned with the wind. In figure 12.11, the gear is shown set for a crosswind landing. Only the front bogies are used for steering on the ground. Although the wing spoilers obviate the need for an approach chute on the B-52, a 44-foot-diameter braking chute is provided for deployment in the landing rollout. The aircraft is not equipped with JATO units for use on takeoff. 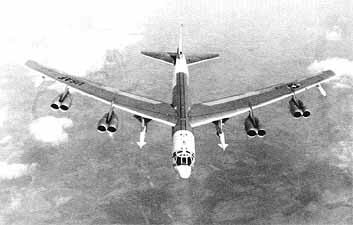 All production models of the B-52 have been powered by eight engines located in pairs of two in four nacelles. All four of the nacelles are attached to the wings by sweptforward pylons that extend below the lower surface of the wing. Except for the B-52H, all models of the aircraft have been equipped with a version of the Pratt & Whitney J-57 turbojet engine of about 13 750 pounds thrust. A fan version of the J-57, the TF-33 of 17 000 pounds thrust, powers the B-52H. This engine is essentially similar to the Pratt & Whitney JT3D turbofan that powers the Boeing 707 and Douglas DC-8 commercial airliners. Much improved performance, particularly range and takeoff field length, resulted from application of the turbofan engine to the B-52. The B-52 is normally manned by a crew of six. Two pilots are seated side by side near the nose in a manner similar to a commercial transport. 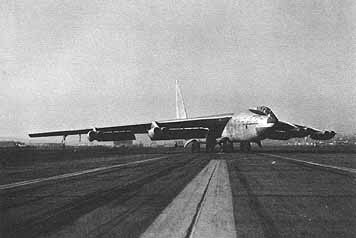 (The two prototype aircraft had the pilots seated in a tandem arrangement similar to that of the B-47. This cockpit configuration can be seen in the photograph of the XB-52 shown in fig. 12.11.) On a lower deck beneath the pilots' compartment are seated the navigator and radar navigator. Behind the pilots on the upper deck are seated the electronic warfare officer and, on the G and H models, the gunner who remotely controls the guns located in the tail. On earlier versions of the aircraft, the gunner was physically located in the tail end of the  fuselage. Movement of the gunner from the tail to a position behind the pilots removed this unfortunate individual from an isolated location that in turbulent air promised a ride similar to that of a high-speed roller coaster. Several types of tail guns have been employed on different versions of the aircraft. A 20-mm six-barrel rotary cannon is installed in the tail location on the G and H models of the B-52. All crew stations are pressurized, heated, and air-conditioned. In the event of an emergency, means for crew escape is provided by upward ejection seats for those on the upper deck and downward ejection seats for those on the lower deck. For those versions of the aircraft in which the gunner was located in the tail, the entire tall capsule was separated in an emergency and the gunner was expected to fight his way clear of this unit and then complete his escape by a hand-operated parachute. Needless to say, the morale of the gunner was greatly increased when he was relocated to a position behind the pilots. With a gross weight of 488 000 pounds, the B-52H is even today one of the heaviest offensive military aircraft operated by any nation in the world. Maximum speed of the B-52H is 639 miles per hour at 20 700 feet, or a Mach number of 0.91, and cruising speed is 525 miles per hour. According to table VI, mission radius is 4480 miles with a weapons load of 10 000 pounds. Many other combinations of payload and range are, of course, possible. 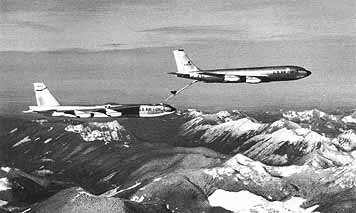 Range is, of course, greatly increased by in-flight refueling. A B-52 being refueled by a Boeing KC-135 is shown in figure 12.13. External configuration of the KC-135 is closely similar to that of the Boeing 707 commercial transport, described in chapter 13. As an indication of the capability of the B-52 with in-flight refueling, a nonstop flight of 24 325 miles was made around the world in January 1957. The flight required 45 hours and 19 minutes. 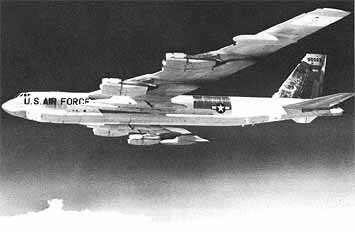 The unrefueled range of the aircraft may be judged by the world-record nonstop flight of 12 532 miles made by a B-52H on January 10 and 11, 1962. Average speed for the flight was 575 miles per hour, and elapsed time was 22 hours and 9 minutes. This world-record flight certainly attests to the high maximum lift-drag ratio of the aircraft, the low specific fuel consumption of the engines, and the large fuel capacity of the aircraft that, in normal operations, can accommodate an astonishing 47 975 gallons of fuel. (An average American automobile could be driven 12 000 miles a year for about 80 years on this quantity of fuel.) Fuel tanks are located in both the wing and fuselage, and a 700-gallon external tank is carried under each wing as can be seen in figures 12.9 and 12.10. The B-52 can carry a wide assortment of offensive weapons including conventional "iron bombs," nuclear bombs, and a variety of missiles such as the ALCM (air-launched cruise missile) and the SCRAM (short-range attack missile). Four Skybolt ballistic missiles are mounted on the wings of the B-52H pictured in figure 12.9; this missile was not put into production. Two Hound Dog missiles are mounted under the wings of the B-52H shown in figure 12.10. The Hound Dog is really a small jet-powered airplane with a range of up to 700 miles and a maximum speed of Mach 2.1. A more detailed discussion of the offensive-weapon capability of the B-52 is beyond the scope of the present discussion, as is a description of the vast array of exotic electronic gear carried aboard the aircraft. Thankfully, the B-52 has never been called upon to deliver a nuclear weapon upon an enemy target. It served with distinction, however, during the Vietnam conflict. Operating from bases on the island of Guam, many thousands of tons of conventional bombs were dropped on targets in North Vietnam. From Guam to the area of conflict involved a round-trip flight of nearly 5000 miles. Total mission times were in the order of 16 to 18 hours. Surface-to-air missiles as well as combat with enemy aircraft were always a possibility in the target area. Certainly, these missions were a severe test for both men and machines. The B-52 was originally designed for high-altitude weapons delivery over the target. Like the B-47, however, the increasing effectiveness of enemy antiaircraft defenses required the development of low-altitude high-speed penetration tactics for the B-52. Again like the B-47, the B-52 has suffered from its share of structural fatigue problems. To cure these problems, many modifications have been made to the aircraft during its long-lived career. But the B-52 lives on and is likely to form a major part of this nation's nuclear deterrent force for the foreseeable future.